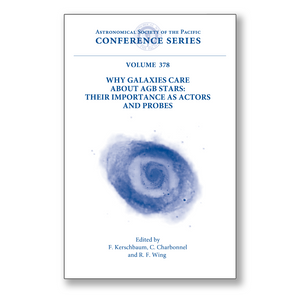 These proceedings of an international conference held August 2006 in Vienna, Austria demonstrate the relevance of Asymptotic Giant Branch stars and stellar astrophysics as a whole for our understanding of galactic structure and evolution. The meeting brought together astronomers from the fields of AGB stars, galactic evolution, and stellar populations. What do we know about the various aspects of AGB stars, such as nucleosynthesis and mass loss, that will play a role in our understanding of galaxies? At the same time, what do galactic models need from the AGB star community, and how are AGB starts included in these models? What will be the role of AGB star research within the major aims of astrophysics in the coming decades? These were the main questions we wanted to discuss at this conference. Recent developments in instrumentation such as the Spitzer satellite and current and forthcoming ground-based equipment are enabling detailes studies of individual stars and the exploration of ever more distant stellar systems. AGB stars are among the first targets that can now be resolved in galaxies outside the Local Group. But of equal relevance are the exciting developments that have been achieved in modeling stellar nucleosynthesis, mass loss, and the evolution of galaxies. The book is suitable for researchers and graduate students interested in stellar and extragalactic astrophysics, and in physical processes related to nucleosynthesis, radiation hydrodynamics, pulsation, mass loss, and the chemical evolution of stellar systems.